My friend has white mulberries in her garden, and huge peach trees she has raised from seed. Lemons and kumquats, figs and pomegranates, a glasshouse full of seedlings ready to plant out. And a motorized scooter to get around her garden. She used to come walk around my garden, but no more. When I go for tea her house is full of lilacs or roses, lilies or iris, and she always asks me "How is your garden?" How do you answer that? A garden is never just one way. 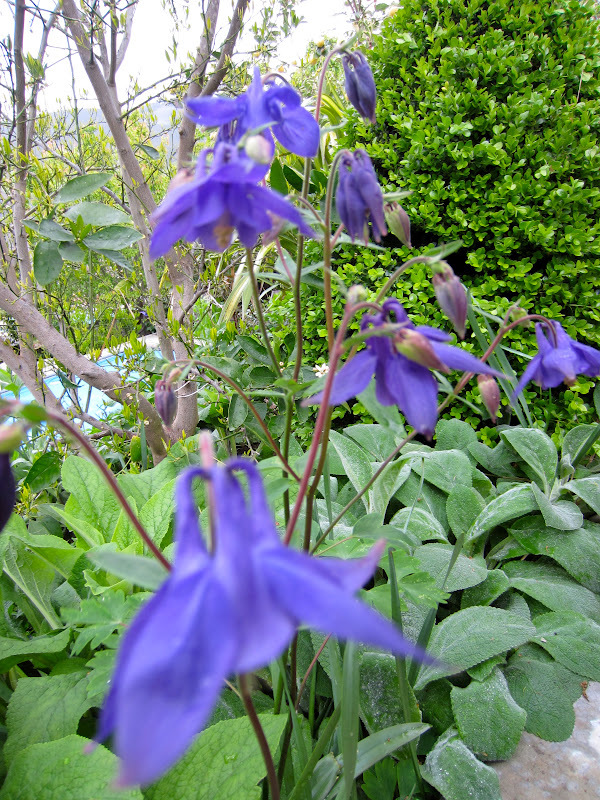 But this spring my garden is the best it has ever been. So last week I took my garden to her. I brought her a small bouquet of what's blooming now, and my laptop with photos of my garden. 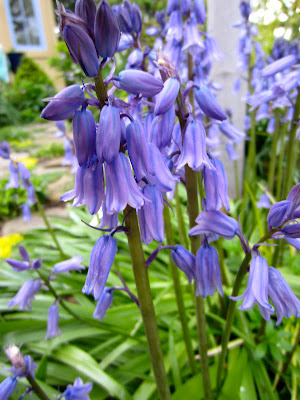 The spanish bluebells came from my friend Sylvia - her garden is a sheet of blue in spring. Mine are more numerous each year, and I finally have enough to share. 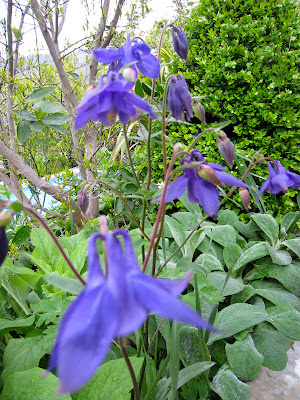 The columbines came from Carol. I can feel her gentle presence when they bloom. I miss her. I don't remember who first told me they got their name from the ring of doves kissing. Remember your Latin? Rhododendrons light up the shade, and caress me with a faint spiciness as I brush past. They will be sticky and brown soon, and the stickiness will coat my fingers as I snap off the endless spent flowers, but they're worth it. and the forget-me-nots that stick to your socks. My mom says when that happens the best thing to do is plant your socks. She's right, the seeds never come off. 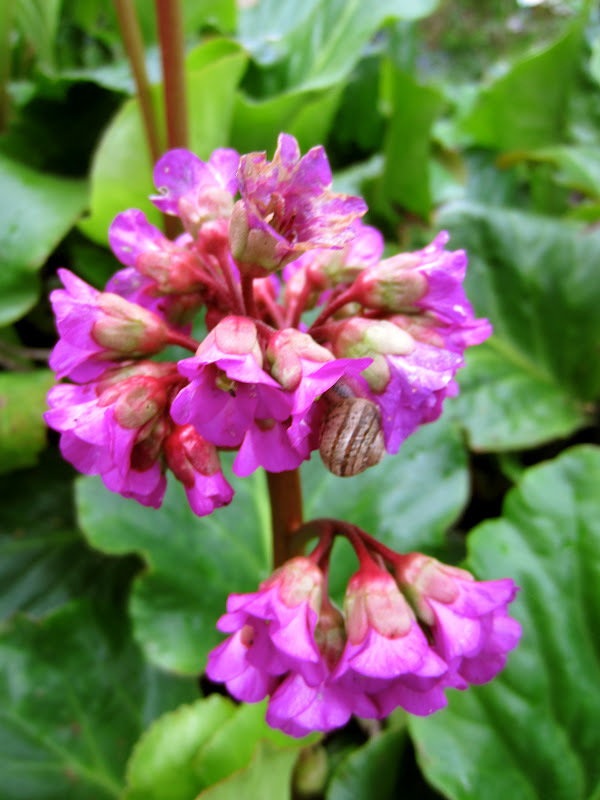 There are bright bergenias with leaves like glossy cabbage. A granny plant, very out of fashion. Too bad. I love it. The first roses of the year are opening outside the bathroom window among the spent peach blossoms, where it is sunniest. When she saw this she said "Climbing Peace! That is my favorite rose!" When a few more have opened I will take her armfuls. If you can't bring your friend to your garden, get out your camera and your laptop, and bring your garden to visit your friend. And don't forget the bouquet, for no matter how small, a bouquet gathered by your hand from your garden will always speak of love. My friend Maryam called and said "I have your dinner - come by and get it." As she is a fabulous cook and a commanding presence, I hopped in my car and zoomed over. She was standing by the stove, with a huge pile of rice and a thick round-bottomed saucepan next to her. "I have Cioppino for you, but you must have it with garlic bread..." check. "...and Persian rice. Nobody ever makes this right, so I have started it for you." Okay. My favorite recipes have been handed down hands-on. "I melted about two tablespoons of butter in this pan, and I added two tablespoons of olive oil and a pinch of saffron. Use really good saffron, the best you can find. "Now you put in the rice" and she scooped about four cups of cooked rice on top of the melted butter and oil. "Then you add dried Persian cranberries. You have to get them at the Persian store, you can't use those American ones." I tasted one - they were tiny, like dried pomegranate seeds, and quite tart. "You just mix them into the top of the rice, you don't want to disturb the part that is in the butter and oil. When you cook it, put it over high heat until it starts to sizzle, then turn the heat down to medium-low, add a tablespoon of water and another tablespoon of butter, just put them on top of the rice. Then put three paper towels over the top of the pan, put the lid on, and cook it for 45 minutes. When it's done take off the lid, put a plate upside-down over the top of the pan and flip it over onto the plate." I did as she said. I must confess I folded the edges of the paper towel in a bit so they wouldn't hang over and catch fire - I once nearly set my friend Cathy's kitchen ablaze. As it was cooking the most wonderful nutty smell filled the kitchen. When we cut into it, it was crispy and creamy, sweet and crunchy where the rice had crisped, and tart where the cranberries were lurking. ...and she laughed with delight. "You did it perfectly!" she said. "Even my grand-daughter has to call when she's making it!" She did of course start it for me, so I suppose that's cheating. But I'm making it again, and soon. With chicken, with salmon, with shrimp in garlic butter...come for dinner!